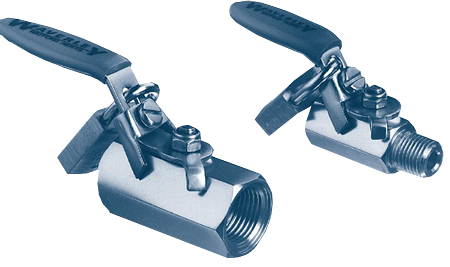 All of Waverley’s 1000lb, 3000lb and 6000lb class Ball Valves can be supplied with lockable handles. This device allows the valve to be locked in either the open or closed position. All of the parts used in the locking mechanism are stainless steel. The locking device is designed to be used with a padlock though these are not supplied. Select the type of valve required. Note the part number of the required valve. Prefix this part number with the letter ·L· (eg. BV2P now becomes LBV2P).